A little girl and her pet French bulldog are the perfect playmates in this all-day outdoors adventure! When his family sets out to explore the neighborhood, one puppy is eager to join in the fun! He gets to do everything his sister does—with his own added flair, of course. Together they eat (pancakes for her, kibble for him), bathe (tub for her, sink for him), and play (chasing squirrels for both). Side by side, they enjoy the same things, each in their own way. And when the long day comes to an end, both settle down for a restful sleep—that is, until tomorrow comes. Because when every day’s a dog’s day, every day is the best day . 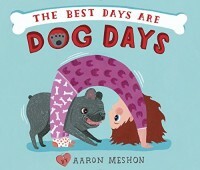 . . especially when you can spend it with the person you love.A little girl and her pet French bulldog are the perfect playmates in this all-day outdoors adventure!